It seems that we have reached peak innovation in terms of fused deposition modelling (FDM) 3D printing technologies. Just a couple of years ago, it seems that everyone had a new FDM printer on the market, with each company promising something slightly different (or slightly cheaper) than the last. Well, the good news is that Stratasys is still innovating, while other companies focus on marginal, incremental platform updates. The latest innovation from the granddaddy of FDM companies comes in the form of a new engineering plastic called Antero 800NA. Antero 800NA is a PEKK-based thermoplastic that has superior chemical resistance and low-outgassing, making it ideally suited to aviation and space applications. Additionally, the new FDM plastic has excellent thermal resistance, making it useful for high-temperature applications such as automotive engine fixtures. Traditionally, PEKK products have been manufactured by either machine- or by powder-based 3D printing. The problem with machine printing is that a lot of waste is produced, which is undesirable due to the relatively high cost of PEKK material purchased in bulk. Parts produced by powder-based 3D printing can suffer from dimensional stability, especially when printing larger parts. Antero 800NA will be coming to the Fortus 450mc printer in Q2 2018, and the Fortus 900mc later in Q4 2018. The good news is that existing Fortus 450mc users with the high-performance material bundle will be able to use Antero 800NA without paying additional license fees. The bad news is that if you don’t have the high-performance materials bundle, you’ll need to purchase the bundle or buy the individual material licence. But, then again, if you can afford one of the Fortus machines, then you probably don’t need to worry about licencing costs! And if you think that the Stratasys material licencing and digital rights management (DRM) policies are a little brutal, then just consider this: how many other FDM companies are creating new engineering-grade materials at the rate that Stratasys does? If you want innovation, then you have to be prepared to pay for it! 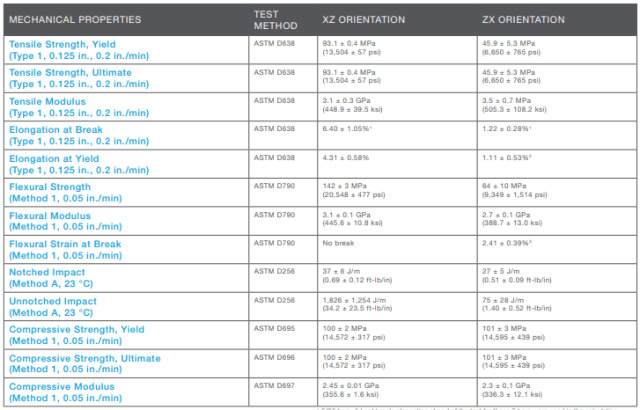 You can see an overview of the mechanical properties of Antero 800NA in the table that follows. 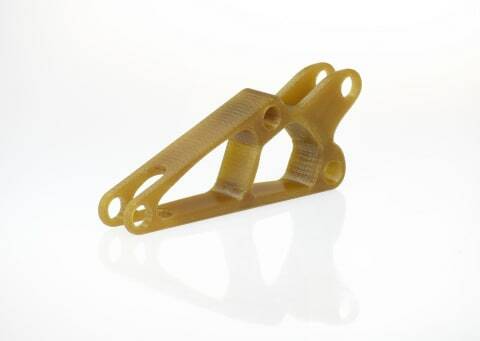 You may notice that the ultimate tensile strength of Antero 800NA (93.1 MPa) vastly exceeds the strength of Stratasys’s ULTEM series of engineering thermoplastics (ULTEM 9085 has an ultimate tensile strength of 69 MPa). Do we have a new king of aerospace-grade FDM thermoplastics? It sure looks that way.